【Newest Android 7.1 OS】 Come with updated android 7.1 Marshmallow OS which is faster and more efficient. 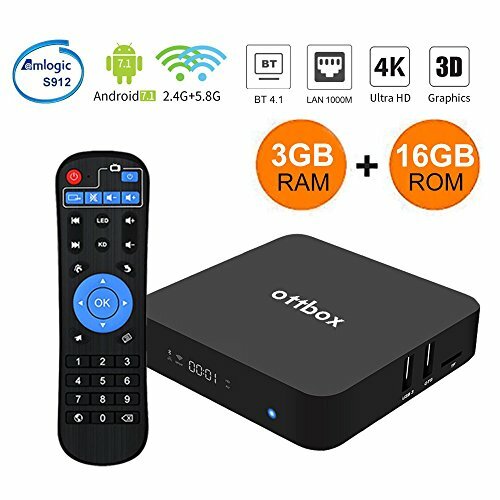 It has a better compatibility of software, such as youtube, Netflix and many games, and support for more USB devices (3*USB Ports + 1*OTG Port). 【1000M LAN + S912 CPU】KUD Z-turbo support 1000M LAN, better than others Top configuration 100M Lan. Besides, it powered by the latest Amlogic S912 Octa core 64 bits CPU, which is way ahead in image processing and computing. Its high machine configuration make sure you will meet high reaction speed and no any buffering! 【3D+4K & H.265】No need go to The cinema to watch 3D movie, Z-Turbo box updated version comes with 4k and 3D function. It supports playing almost all popular audio and video formats, bringing you to enjoy 4K ultimate HD video. H.265 Hardware decoding can saves 50% of bandwidth resources, you can watch movies fluently. 【Best Guarantee】KUD TV BOX have Worry -free 12moth warranty and friendly customer service. Anytime you have question during usage, please feel free to contact us, we will provide you professional problem-address solutions.